The FiberStrike® LCM 2500 Interrogator developed and manufactured by Cleveland Electric Laboratories, is a state of the art solution for monitoring the security status of virtually any access portal such as hatchways, manholes, hand-holes, and vaults when integrated with our LCM 600 series Interlock Switches. The interrogator is designed to display and control alarm event switching for up to 64 optically based limit switches. When a switch is opened or closed – the associated dry contact relay output will be activated in less than 500ms (1/2 second). The tamper proof design reports fiber cuts and / or optical attenuation as alarms. The dry contacts also provide power failure detection. The system incorporates Cyber-proof architecture and can be deployed using existing infrastructure. With nearly limitless working distances allowed by fiber optics, interlock switches can be networked over a wide area with no end point termination required. Additional advantages include the passive nature of each sensor with no need for power at any sensor location, immunity to environmental problems that plague electrically-based sensors, and the ability to link virtually any number of sensors over nonconductive optical fiber into a single monitoring system that can be tens of kilometers removed from the sensing area. The LCM 2500 Interrogator can be mounted in an industry standard 19” rack. System configuration is controlled through user friendly menus accessed via front panel controls. Convenient onboard data logging stores events for historical review. Custom configurations are available for larger sensor count systems as well as Physical Security Information Management (PSIM) software based systems where C3 or C4 integrations is required. System diagram depicting four discrete optical switches series connected via single strand of fiber and no end termination. 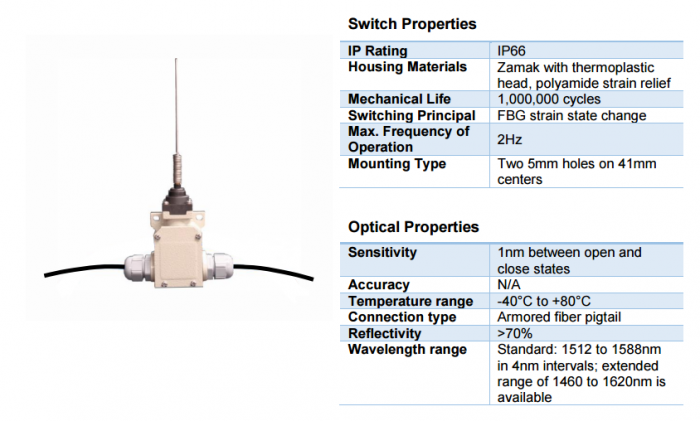 Switches may be located up to 10mi / 16km from the controller and utilize industry standard telecommunications grade 1550nm single mode fiber.